A team of scientists claim that they have found a mask depicting an Australopithecus afarensis, a human ancestor that could have possibly given birth in a way that combines the childbirth practices of chimpanzees and human beings. Now, researchers claim that this new finding could shed light on how modern human childbirth evolved and paved the way for large brains. The scientists detailed their findings online April 12 in the journal The Anatomical Record. The new study reveals how the ancient relative of mankind known as "Lucy" could have given birth in a way that combines how chimpanzees and humans give birth, with newborns going through a bit of tilting in the birth canal as they were born. "What we found with Lucy was very much in between that of chimpanzees and humans," the study’s lead author Jeremy DeSilva, a paleoanthropologist at Dartmouth College in Hanover, New Hampshire , told Live Science . The Death of Lucy: Has a 3.2 Million-Year-Old Mystery Finally Been Solved? "Because their mechanism of birth would benefit from having helpers, it paints a picture of Australopithecus as a much more social animal, perhaps helping one another out during childbirth. The origins of midwifery may very well extend back over 3 million years." Lucy, an Australopithecus afarensis, is one of the first known relatives of mankind and her species body’s structure was designed for walking upright. Previous research of how early hominins gave birth usually emphasized the baby's head and the mother's pelvis and ignored the newborn's shoulders. He also told Live Science this is the first time a study focuses on the newborn’s shoulders and not its head, “This is the first time the width of the shoulders has been considered in an attempt to reconstruct childbirth in early hominins. I'm excited anytime we can take these old fossils and bring them back to life and reconstruct what our ancestors and extinct relatives were doing." "I think we have a tendency to think about Australopithecus and about Lucy as being quite ape-like. Sure, they walked on two legs, but in most other ways, we imagine them to be like modern apes. For some aspects of their life, this is probably true, but in terms of childbirth, our findings would suggest that they were more like us — not exactly like us, but more like us." In conclusion, the findings of the study indicate that the progress and evolution of rotation during birth probably took place in two different stages. First, after hips designed for upright walking evolved, infants began rotating a bit in the birth canal so it could fit the head and shoulders. After, as brains would grow bigger in the human species, full rotation eventually started taking place during childbirth. DeSilva is committed to continuing his research in the future and hopes the examination of childbirth in other hominins, such as Australopithecus sediba, will reveal more information about the evolution of birth for our kind and our predecessors. Nor do I and I am the scientist who led the team that worked on this study. We did not find a "mask"-- I have no idea what that even means. 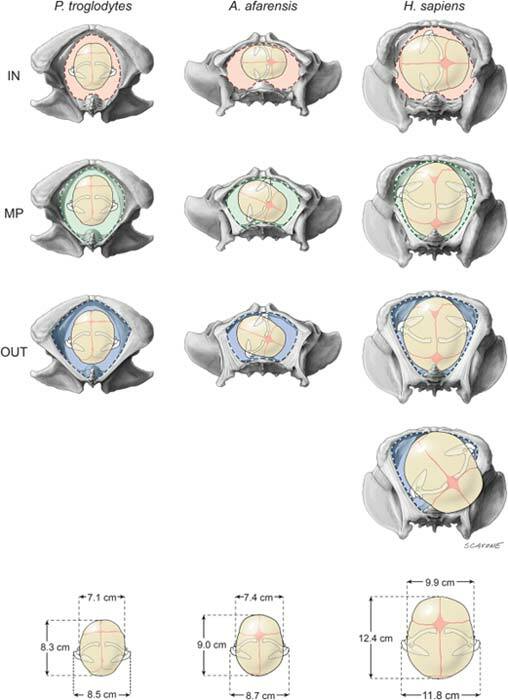 We studied the geometry of the preserved pelvis from "Lucy"-- a female Australopithecus, and inferred from dimensions of a hypothesized infant (modeled after a chimpanzee infant) how the baby's head and shoulders would have been able to fit through the birth canal. The study did not involve a "mask". The author should remove that sentence, but I have not been able to find a contact for Theodoros Karasavvas. "A team of scientists claim that they have found a mask depicting an Australopithecus afarensis"
They cannot all have been dark because when food supplies north and south of their development areas were more advantageous, and they moved, perhaps sickle cell anaemia was in the blood and many would die until that died out. Those from the forests would benefit because they would be less brown and more red haired, and breeding with the red haired Neanderthals would have strengthened the species. Racial difference is neither negative or classist. It is a purely physical response to different conditions a species needs to adapt to for survival. This is just an idea and not founded in any practical research but someone might like to consider this in their own research..
Its about sunshine and melanin - nothing new. 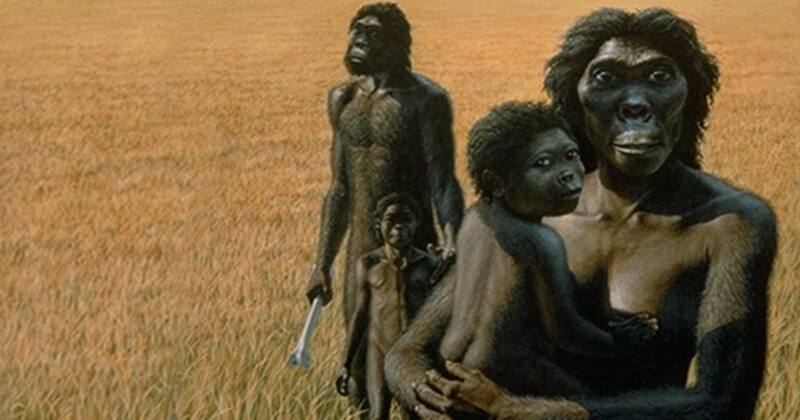 These human ancestors evolved in Africa, not Greenland. Read more about The Death of Lucy: Has a 3.2 Million-Year-Old Mystery Finally Been Solved?